HomeIs This the True Nature of Occupy? Is This the True Nature of Occupy? Scene outside one Occupy casualty scene in Vancouver. I am a student at the University of North Texas, the site where this week Darwin Cox, 23 was found dead in his Occupy Denton tent colony. The more I thought about it the angrier I became. First I must say, although I disagree with much of their assumptions and their premise for this movement, I respect their right to meet and peacefully protest. They have the right to speak out against a system they believe isn’t working in their favor. This is guaranteed them in the constitution. I promise you, I fought for it. We as a democratic people must remember that everyone has the right to gather, organize and be heard. What I saw this week on my native campus, however was deplorable. A young man died in one of those tents. Some would say this isn’t news, being that he isn’t even the first. As I write this he is the 8th death of members taking part in Occupy protests. What happened in this case is that a man died and those citizen patriots, those virtuous idealist and martyrs of American justice, abandoned him. Saturday night police were directed to the occupy tents on the University of North Texas campus in Denton Texas. When they arrived on the scene the encampment was empty, the tents vacant save for the tent where Mr. Cox was found. This much is certain. These ideals seemed to disappear the moment that reality hits. When a group of irresponsible delinquents preaching as if they understand moral virtue and societal goodness come together to result in a man’s death how do they deal with it? They all scurry away like roaches brought into the light. 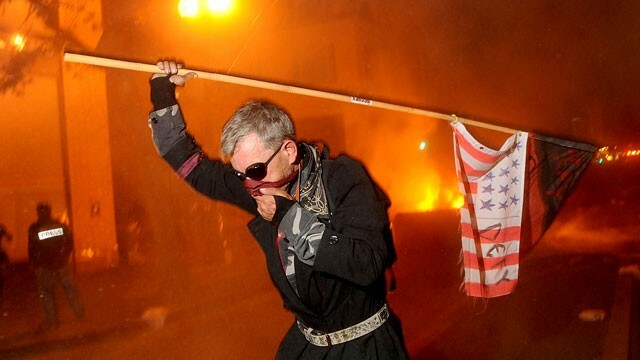 Occupy Oakland member waves a defaced United States flag. At the root of this I think is the nature of Occupy itself. Within this group is the beating heart of an anarchist movement where a leaderless mass together topples the “system”. You know what is an interesting aspect of leaders? They are the people who accept responsibility for their actions, in victory and in tragedy. What you have demonstrated here on the University of North Texas is simply gross negligence and a lack of basic human decency. My viewpoints are harsh, but that is because I believe in higher principals. I served two tours in Iraq with the United States Marines. I may have hated the people I worked with day after day, but we learned early on that the most important human qualities are shown when supporting the fallen, the wounded and the weak. We learned that leaders do not just take credit for a win, but lead through adversity, and take responsibility when they fail. Let me try to control myself long enough not to get into the “Leave no man behind’ ethos. For such an inherently hypocritical, insidious act to occur should tell the rest of us that no matter what Occupy protests, they are not ready to influence our way of life. They have shown a history of lacking a true respect for human life and well being while demanding to be shown the same. They are demanding to rewarded by society when they seek to add nothing to it. This is the true nature of occupy, a group of kids out to party, making demands and giving out speeches about human rights, but when adversity hits they have neither the intestinal fortitude nor virtue of spirit to what is truly right. Rumors have been flying around the campus lately about the situation surround Cox’s death. Many refer to illicit drug use known go on in the camp. The weather here has just taken a turn so the boy may have frozen. There may be other factors. Each of these reasons has been linked to other deaths in the occupy movement and now even talks of sexual assaults. But at this time I don’t think it matters if Darwin Cox died from drug use, from exposure or violence. There were people at those tents who should have been capable of preventing his death. These same people cry out justice, yet they won’t take responsibility for their actions. They cry out against corruption yet they have shown no character with which to corrupt. They scream for equality yet they still live as one of theirs is dead. Whatever your views on the rationality of Occupy you should know this. The 1% did not kill Darwin Cox. A greedy government did not kill Darwin Cox and no “system of repression” is responsible either. Occupy killed Mr. Cox, or at least did nothing to stop it. (Edited December 20, 2011) I have been asked to provide citing for my article. My first source is an official letter sent by the president of the University of North Texas immediately after news of Cox’s death. This was the first news I received of the incident. You can view a copy of the letter posted here. President’s Letter to UNT students. As to the statements about drug use, you can find that on Occupy Denton’s blog posting they admit that the Cox has suffered from drug use and that it is likely the cause of his death. Occupy Denton site. For those feeling the post to be to biased a news link has report where Occupy Denton’s official spokes person spokesman Garrett Graham is provided here. He also mentions that Occupy members were present, however other reports state that the camp was empty when police arrived. News of Cox and other’s drug involvement and poor self-policing system at the camp is also reported here. For those concerned about weather, here is information for the city of Dallas on that day. Remember that the death occurred at around 4:15 PM and while this day was cool, this was not weather that should be able to kill a 23 year old man. My assumptions from this information are that the man died of drug use while on the encampment. I believe from information shown that other occupy members were present and knew of his and others drug use. What is certain is that while their spokesman said he was said that before his death he was “uncommunicative, lathargic and had a fever” which does not support other reports, some by Occupy, that his death was likely due to his drug use. What is also certain is that signs of the situation were seen by members who failed to seek help for Cox, the members fled the scene before police arrived and that illegal activity was happening at the camp, against both state and university rules, without being policed by the members of Occupy Denton. This was why I wrote this post. It isn’t because I do not support protesting. If you read my comments at the bottom I make this very clear. I feel that when a moral populous stands up for perceived wrong doing of their governing body that that is a righteous and democratic act. I use the Montgomery Bus Boycott of 1955 as an example of protesting done correctly by a moral group of citizens. What I saw and read about in Denton was not something that would have happened if the members of that group showed the moral excellence they demand in others. ← Should there be a Marine Corps Academy? Firstly, I must say that I am from England and therefore cannot comment on specific issues within your own democracy although our system mirrors yours in most ways. I would also like to say that my Uncle (by marriage) is a former US marine and therefore I have a huge amount of respect for what you guys do and for the armed forces in general. I however do not believe that war is good or that building an economy on military action as the United States and its allies have done over the last fifty years or so brings anything but injustice, inequality and the stealing of foreign resources. The whole purpose of war is to make money by sending the poor of one country to destroy the infrastructure and society of another group of people, to then re build it using major contracting firms from the occupying country. Whilst people such as yourself should be applauded for their bravery and for defending the values we consider to be true, you also have to accept that people have a right to say that the people who sent you there in the first place were sending you to potential death for their own gains. We have a right to say that the wars in the middle east are not just and we have a right to point out where your arguments may be flawed. With that in mind whilst I absolutely respect your opinion and understand where you are coming from, I believe you have made a couple of dangerous assumptions regarding this mans death. You have assumed that people saw or heard him in trouble and decided not to help, may I ask what evidence this is based on? We are talking about a significantly large group of people hear, not dissimilar to a festival type camp. People die every single year at all the major world wide festivals, it happens, does this mean they should be banned? I can poke my eye out with a fork, should we also ban forks and talk about how dangerous they are? The chances are that this gentleman either died alone in his tent in the night when people were sleeping, or died alone in his tent during the day when people were protesting. Either way its hardly surprising that no one came across him. Of course he could have been murdered, he could have taken drugs, he was a student living on the street amongst a large group of strangers, both of these things could easily have happened, but why does that mean that the occupy protest is wrong? In any large group of people bad things can happen, but it doesn’t actually mean that the cause is bad, you cannot make sweeping generalisations based on anomalies, it leads society down a dangerous path. You cannot expect empathy from others until you are able to empathise yourself, I see very little effort to understand the occupy point of view, but that doesn’t mean your wrong, it just means you need to consider your arguments from a position of greater neutrality. I will post your blog on my blog, I believe its really important to give people the opportunity to look at two different points of view and I hope you will do the same. True freedom is the freedom of the mind, but first it must be open to everything and you must want to be wrong, as this is the only way we can grown and be free. I think most of your reply is trying to support the nature of protesting, and not about the issue of how the Occupy movement are conducting themselves. What my article said is not in attack on the nature of “protesting”, but on the culture that is growing within Occupy member groups. 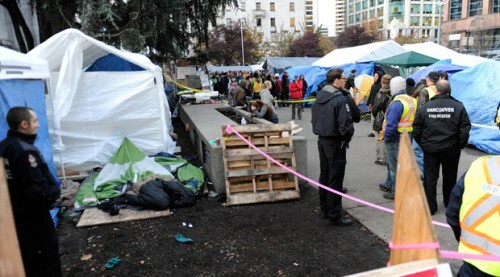 Violence, death and sexual assaults have all been attributed to Occupy tent colonies. You mention that in large groups form there is always some people who act like this. Do you believe that that happens when our Republican, Democrat or Libertarian parties meet? Do you believe that the topic of your blog, protesters advocating better benefits for public workers, abandon one of their own one night? And as far as evidence the University released a post on Facebook the night it happened. “A white male was reported dead today in the 8-tent Occupy Denton encampment on the University of North Texas campus. 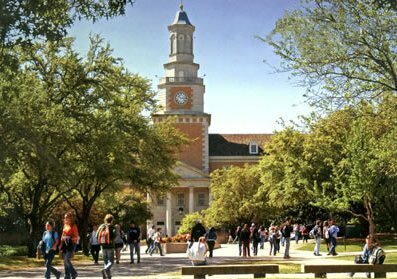 According to the UNT Police Department, the time and cause of death is unknown. 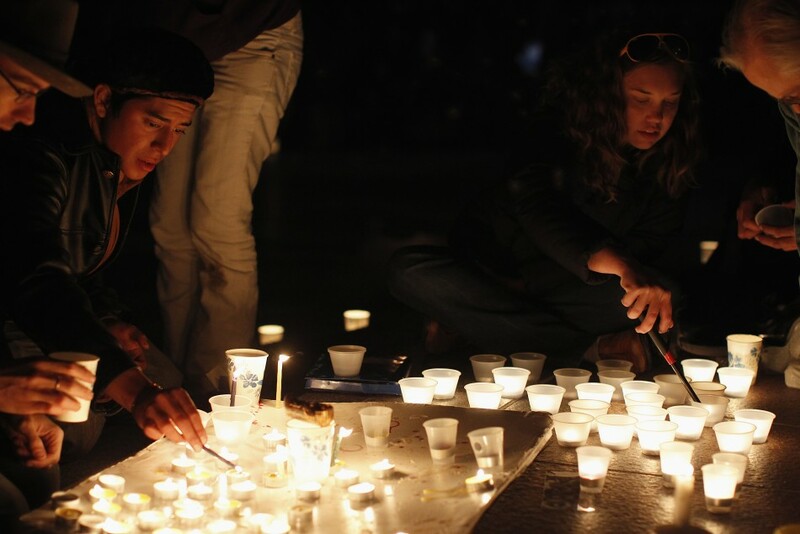 The deceased is believed to be an Occupy Denton participant. The encampment appeared to be otherwise unoccupied when officers arrived at the scene. The area has been secured while the UNT Police conduct an investigation. Without considering political views, ideologies or anything else, from this report we can see that a group of tents which had been occupied was mysteriously empty when it was found that a member was dead. For the better part of a month there has been numerous tents occupying the location, with people in them. That none were present when Police arrive leads me to one conclusion on the matter. I think my post makes it clear to that these people abandoned their member. Even if they didn’t have any direct responsibilities in causing his death, they did have a responsibilities to not abandon the guy after they died. And when groups come together and things go wrong there are usually people who can be held accountable. Fortunately for occupy, they have no leaders. So it seems they also have no responsibilities, consequences and seem to have also proven no principles either. But they have demands. What my post is about is to throw question to others, not about the argument, but the people having it. If you can’t conduct yourself in a manner that is deserving of political consideration, that reflects the high minded ideals you preach, then you really lose the right to be considered. In my eyes Occupy has done that, on numerous occasions. If we had activists that could conduct this in such a manner that deserved respect, maybe the rest of us would listen harder when they start speaking about justice and society. Protesting is not always “a gentleman’s sport”. You have a right to your opinion, but understanding is based on experience. I am an early 70’s graduate of NTSU. Vietnam Anti-War Protests were a daily part of campus life throughout my college years. Protest is nothing like a LINCOLN – DOUGLAS debate. However as history has shown. OUR POINT WAS MADE AND CHANGED POLICY ! Once again, I am feeling the need to remind readers I am not talking about protesting as a problem, but the nature of this group’s people who are protesting. I feel that we should not consider changing policy in response to people who lack the moral convictions to even take basic human care of their own. There is a right way and a wrong way to express civic disapproval. Interesting development I think. Speaks to the commitment of the movement I would say. I am actually a TWU alum and am quite familiar with Denton. One of my good friends is in the Occupy Denton movement. My feelings on it are mixed enough that I couldn’t even vote in your polls. A little background… I have some very conservative (close to libertarian) viewpoints and some Democratic viewpoints. I’m against corporate greed and unfairly checked capitalism (though I am for capitalism, as long as it’s both the government AND the people are sensibly regulated). If you think about human nature, people will do what’s in their own best interests, whether it’s good for others or not. That’s why a strict libertarian or strict communist system isn’t effective. People will abuse whatever system they’re in. These are the beliefs I bring to the table when I look at the Occupy movement. I will be the first to admit that I was privileged and had incredibly smart parents who were ahead of the curve. I believe those are blessings from God and that those blessings have enabled me to be successful and to help others achieve success. I have a lot of friends who haven’t had the advantage of either, and people like that are the voice of the Occupy movement. I understand that some of the loudest Occupiers are, like in any other people group, a little weird/inappropriate/off-base. What I really think a lot of this boils down to is a nation built on credit and globalization. You have people with terrible money-management skills and a rapidly changing economy that relies on outsourcing…a recipe for disaster. Most people aren’t forward thinking, and they are behind the curve. Those are the people who raised the Occupy generation. Also, the ones in between (today’s 30-somethings) have gotten the rotten end of the deal. It’s a really tough market out there, and it takes incredible strength, talent, and money to stay ahead of the curve. I do believe there are reforms that must be made, and I do think that corporate greed should not be allowed to thrive. I think that it’s challenging to “create” jobs. If you’ll remember, it was the New Deal AND WWII that pulled us out of the Great Depression. I think that welfare and social security need reforms. I am not radical and think they should be abolished. The government needs to protect its people, and that is a form of protection. They are filling in where the Church has failed. I feel really sorry for kids who are in college and who have graduated. I think it’ll take them a long time to get on their feet. I really wish that the Occupy movement had an official list of demands/ideas and was more organized. That is what prevents me from supporting it. I don’t want to identify my self with something that turns out to be very negative, you know? Thanks for your reply. You touched on a lot of things here. It is late though so I will try to be brief in my reply as well. I don’t think anything you said was offensive. Pretty fair actually. I agree with you about some of the things that all came together, like who is gravitating to Occupy and the reasons they believe the way they do. You mentioned the generational changes taking place that are effecting this that makes for an interesting idea for future posts. Where Occupy today is concerned though, although I don’t agree with what they think will cure America’s ills I support that they are trying to do something about it. I obviously though, don’t support the way they are doing it and I think you hit home with why. It’s all about the leadership. If they could get a real agenda, a real mission statement and some real leaders, maybe they would receive some real support from the mainstream. Whenever I think about a successful protest I think about the Montgomery Civil Rights movement, where the entire cities black population protested the unfair treatment of African Americans. Obviously now we see this as wrong, but we need to look at how they did it. They had strong leaders in the church who had weekly visits with the community (might as well get’em on Sunday) and they had the stamina and fortitude to walk or carpool to work for over a year. They even created a free taxi service that got people around the city so they didn’t have to ride the bus. That taxi system was said to have had military efficiency. All this in the prospects of bringing attention to the civil rights issues of that era. They did this peacefully, in an organized manner and conducted themselves in a manner that they can be proud to tell their kids and grandkids about. This is something that Occupy hasn’t yet shown. They haven’t shown that they have a strong, moral leadership, they haven’t shown an ability to strategize effectively and they haven’t shown an ability to adequately take care of their own. If they could show the kind of discipline shown in 1950’s Alabama they would deserve my respect, but until they do their message (if they had one) is lost on the actions going on in those tents. Thanks! I try to be fair, because I know people have had experience or observations that have led them to the beliefs they hold, even if they are untrue or illogical. I’m certain that some of mine are, as well. You seem to hold a very balanced view about the Occupy movement, and you bring up EXCELLENT examples about the Civil Rights movement. Until they organize, I don’t think it’s a movement that I can truly support. A lot of these post-modern movements are like that, unfortunately. TWLOHA and Live 31 come to mind. Raising awareness about things is not enough; there must be organization, goals, and systematic action! Young people, more than anyone, have the vision and energy to change the world, but that’s not enough. I am 100% for the protest that have happened throughout America over the last two years, THE TEA PARTY MOVEMENT (which was more of gatherings then protest), The Walker protest in Wisconsin, and the recent occupy protest. What is disgraceful is how the occupy protest are being handled. I cannot stand for any protest that has allowed violence to be a main method for their cause. 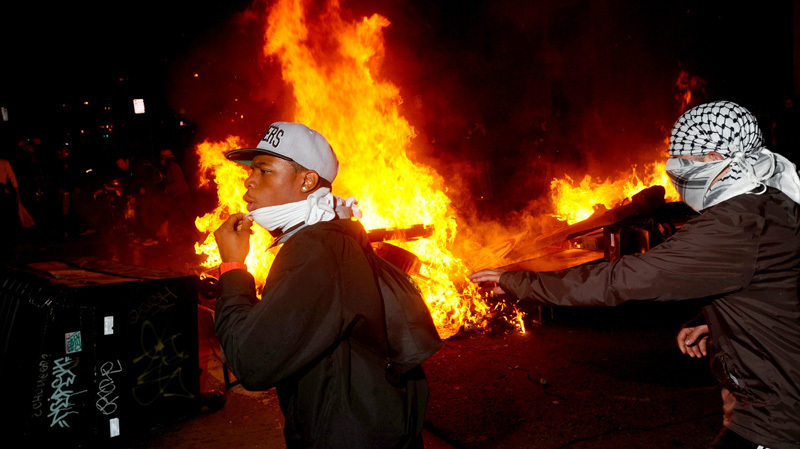 Any protest that is ok with throwing objects at police officers is not acceptable. To me, this is a declaration of war to that state and it stops being a protest and begins to be a rebellion. To leave a fallen “Comrade” as you have stated so well in your argument, is a disgrace. OWN UP TO YOUR BELIEFS AND YOUR ACTIONS, to do as they did is showing the hypocrisy of their movement. It boggles my mind that they believe that blocking places where average people work is going to help them. Average people, people that need to work to pay bills, how sad it is that the protesters are ok with denying workers the right to enter into their work places. It also saddens me (and this was very prevalent in the Wisconsin Walker Protest) that they are ok with pushing their way into a given space but will not allow others with differing opinions into that same space and become somewhat hostile when this happens. As a libertarian I want protest, I want the voice of the people to be heard, I want the people to have a say and if protest is the only solution, then let it be done. But as a libertarian that thinks beyond me, I have to realize, my liberties and rights stop when I infringe on someone else’s rights or life. These people do not represent the 99%, they represent maybe 10%. They hide behind their own agenda pretending that it is for the rest of us. Well, if that is how the rest of us are, if this is what we have allowed our society to become, if they are truly a reflection for 99% of the U.S. then maybe it’s time we have a totalitarian government that will teach us how to behave in a more civil manner or be severely punished otherwise. But as far as I am concerned, they are not the 99%, they are the 98.9999999999999%, because I am removing myself.